A successful summer of history and heritage has come to an end for Whitehill and Bordon residents. The National Lottery Funded project, ‘Welcome to Whitehill and Bordon’, ran from March to September 2018 and reached its conclusion with a Heritage Exhibition at Radian’s Café 1759. Radian has been working with Hampshire Cultural Trust (HCT) on the six-month project, helping participants and volunteers explore the area’s rich and interesting past and present through interviews, artwork, events and exhibitions. The project aimed to use local heritage to connect with and welcome new residents into the area while creating a sense of place and ownership for all who live there. Volunteers who ran the project were given the opportunity to learn about exhibition design and how to conduct oral history interviews. Various events were organised to collect stories; drop-in sessions for residents were run regularly, as well as a ‘Summer Sundae’ event with stalls, games and a picnic, both allowing for interviews, photos and artefacts to be shared. The oral history interviews uncovered information about the British Army, the railway, the twinning of the town, shops in the high street, the Empire Club, the carnivals, the formation of Woolmer Forest Lions Club and the Blackmoor and Whitehill Women’s Institute. These stories were displayed at the final heritage exhibition alongside a memory wall that allowed visitors to share their own recollections on the day. 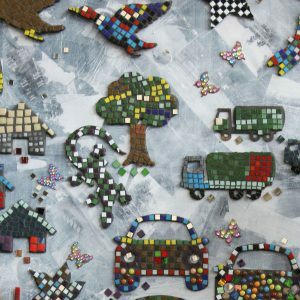 Sixty students from Bordon Junior School worked with artist Lindsey Southworth to create the centrepieces of the final exhibition – two large mosaics depicting scenes inspired by the stories gathered from the interviews. The students involved also used the project in their work towards completing an Arts Award qualification. Paula Windebank, Community Development Officer at Radian, said: “We were really pleased to be able to deliver this project with Hampshire Cultural Trust. Working with pupils at Bordon Junior School and helping them better understand the history of Whitehill and Bordon was very rewarding. Residents also had the opportunity to visit local heritage sites, including the Curtis Museum and Allen Gallery in Alton, who welcomed a group from Radian’s Oak Lodge sheltered housing scheme. The project has been a great success, with various activities and events bringing together a growing community while providing opportunities for learning and engagement. If you didn’t get a chance to see the exhibition, selected items will be displayed at the Allen Gallery in January 2019 to showcase the images and outcomes of the project.